I’ve compiled a list of some of my favorite ways to celebrate and commemorate Dr. Martin Luther King, Jr. 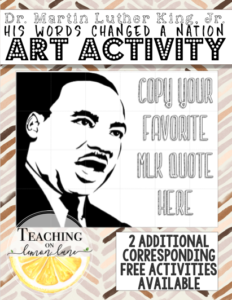 These activities are great for MLK day, Black History month, or any time of year. Below I will share a few of my absolute favorite picture books that highlight his life and legacy, as well as my favorite place to find primary sources and lesson plans, a fun Reader’s Theatre, and of course a few of my favorite Freebies. Thanks again for being here. Martin’s Big Words: The Life of Dr. Martin Luther King, Jr. 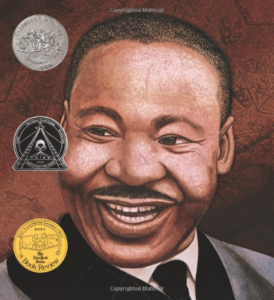 This is a beautiful book that commemorates the life and legacy of Dr. Martin Luther King, Jr. Because of the focus on his words, this book is the perfect companion to the free MLK Quote activity available here. 2. I Have a Dream: Book and CD Another beautifully illustrated book. This book is wonderful, it pairs Dr. King’s most famous speech with breathtaking illustrations. There is something so powerful about using a picture book in the classroom. This one is sure to captivate your students as they hear first hand the words that helped change and continue to change the nation. 3. Martin Rising: Requiem For a King It’s honestly hard to put into words how much I love this book. If you are looking for a something that stirs something inside you, that brings life to the man that changed history forever. You need this book, your students need this book. “Andrea’s stunning poetic requiem, illustrated with Brian’s lyrical and colorful artwork, brings a fresh perspective to Martin Luther King, the Gandhi-like, peace-loving activist whose dream of equality — and whose courage to make it happen — changed the course of American history. And even in his death, he continues to transform and inspire all of us who share his dream.” The author refers to her writing as “docu-poems” because of the historical and educational nature of her words. Read the reviews, the book is a knock-out. When using primary sources in the classroom remember to set expectations. Before the lesson talk to them about how to appropriately react to the sources being used. Notify them that some of the sources may stir their emotions and that it’s ok, in fact it could even be the whole purpose of the lesson. Simply sharing his famous, “I Have a Dream Speech” is the perfect use of a primary source in the classroom. 5. Scholastic Reader’s Theatre: Non-violence on the Move. You’ll come to learn I love reader’s theatre and the enthusiasm they bring. This is a great script for 3-5 graders. Whenever there is a limited amount of characters or roles, I simply split the class in two, or smaller groups depending on the amount of parts. I always figured it was better for the student to play two parts than a non-speaking one. Something that worked well with dividing out the parts in the scripts was to write the roles on the whiteboard, and then call out students and have them write their name next to the part they wanted. Then I would give each student a script and have them go through and highlight their parts. When we were finished I would hold on to the scripts to use year after year! 6. Explore Lesson Plans from the King Institute: I had to share this resource! An absolute wealth of quality lesson plans that focus on Dr. Martin Luther King, Jr., his life, legacy, beliefs, the time surrounding him…etc. Most of the lesson plans are geared towards 6th grade-12 graders. However there are a few lessons for elementary students as well. These lesson plans are another example of using primary sources in the classroom and using them WELL. 7. 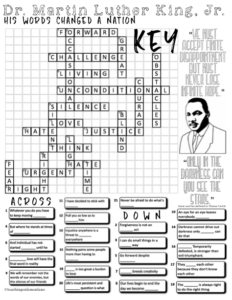 His Words Changed a Nation: Free Crossword Activity This activity is on of my favorites. Honestly, it was a really awe-inspiring to put this resource together. I was blown away by his wisdom and grace. I felt like I had done him and myself a disservice by only ever reading or focusing on one incredible speech when there was SO. MUCH. MORE. 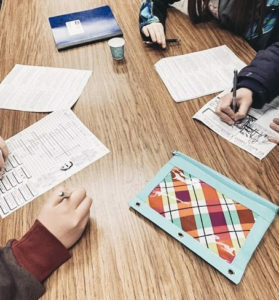 Students complete this activity by studying some of his most impactful words, then using those words to answer the prompts for the crossword. 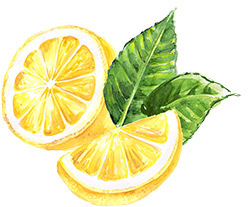 This is a FREE and exclusive activity to subscribed teaching members here at OnLemonLane.com Click on the link above to download. Remember signing up to be a member is free and easy peasy Lemon Squeezy! 8. His Words Changed a Nation: Quote Activity This is another free activity that makes a wonderful companion to the crossword puzzle. 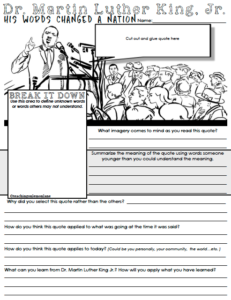 In this activity students use the same quote sheet they used/will be using to complete the crossword puzzle. Except this time they select a favorite quote from the sheet, cut it out, and glue it to the response sheet. 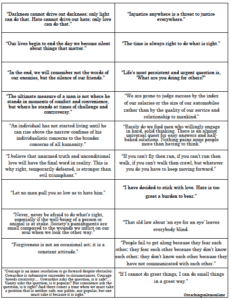 The response sheet is a place for students to answer prompts, break down any unknown words, and apply the teachings of Dr. Martin Luther King, Jr.’s words. 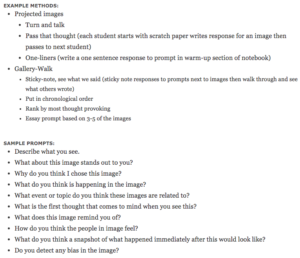 This activity drives for some really beautiful class discussion. Even the simple question as to why one quote was selected over another can be really inspiring. I’m confident both you and your students will leave better after this activity. Because that’s the type of influence and change his words brought about… and still bring about. 9. His Words Changed a Nation: Art Project. The final free activity I have for you is this simple gridline art project. Simply project the example of the finished image for all of the students to see. Then have students do their best to recreate the image. Because the large picture is broken into grids, students will work on one square at a time. Thus, simplifying the big picture. When there picture is complete, they can add color, or ink, or other mediums. I have also left an area for the students to again write their favorite MLK quote. These make for a great display on the bulletin board, or in the hall. 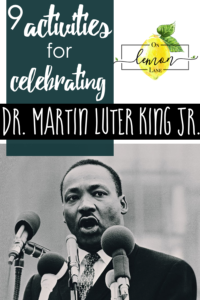 If you liked the activities above and want more, make sure to check out this post for ideas and activities for Black History Month Here you will find more freebies and another On Lemon Lane member exclusive. You can also share your own ideas or join in on the discussion happening on the Teaching on Lemon Lane Facebook Group! Thanks so much for stopping by! I hope you enjoy the activities listed, I would love to hear from you and how they go. 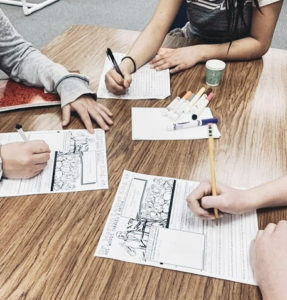 I love to be tagged in your students work on Instagram! Happy Teaching!